And stitch. And stitch. 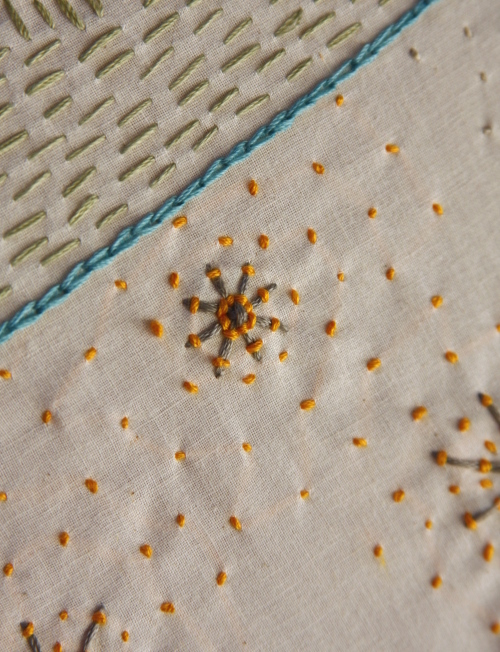 I then I go off to do other things but I think about stitching as I'm doing the other things. Then I finally get back to stitching after I've done other things for about seven minutes. When I'm stitching I'm not emailing. I'm not texting. I'm not talking. I'm not writing. Not negotiating. Not invoicing. Not shipping. Not receiving. Not cutting. Not even sewing. I'm stitching. I don't know what I would do without it. I'd go do the other things, I guess, and maybe be just a little less happy. I dare say I would know myself less, too. Stitch, I love you, don't ever leave me. *A needle pulling thread,* and Anna Maria sharing her reflections... a few of my favorite things. Well, I am so glad you love to stitch! Your blog (and book) is helping me learn to stitch, too. Thank you for sharing so much of your creative and full life! Love the pictures--they're lovely. LOL... I am so that way, too. My stitching calls to me. And there is something so liberating about handwork. I know people that find it tedious, but not me, I find it rejuvenating and pensive! I also seem to always find just one more spot on my work where I can put another stitch or two! Your piece looks lovely. I'm glad working on it brings you peace! i feel exactly the same. meditative. I know exactly what you mean. When I start an embroidery piece I just can't stop until its finished! Wow that is so lovely and inspiring. I'm thinking my girls need some more monograms in their lives! And unfortunately, stitching for me is not meditative. Since it's usually a companion to trash TV, or listening to the radio. I know, it's terrible. Maybe I can try to embrace it anew as a clear minded and peaceful craft (at least until Gossip Girl is back on). I feel that way about knitting. But now I want to feel that way about stitching too! I love that "B" I wish I knew how to make one for myself. I guess it's time to sit down with your book and my tutor/mom and learn a new skill. I haven't done any "real" stitching but I am feeling a strong pull to start...especially after reading this post. Thanks for the inspiration! Any hoop recommendations? I've been itching to stitch (sorry, I couldn't help it because it's true) but I have no supplies. Stitching is very therapeutic. Tell us more about the design. Are you making it up as you go? Is it freehand, or did you do some marking? I really identify with you on this one. Coincidentally, I have just posted about the redemptive power of sewing. Ooh - I really like the big B! Your stitching looks great! I need to get back to that, sewing and work got in the way last time. I've got a stitching project I need to get back to. Thanks for the post and your stitching is beautiful!! I love your stitching--it's so inspiring. I especially love those starbursts. I want to break out my hoops and needles now. Thanks for sharing. I've never been big on yoga, medatation, or the like-- stitching is how I find my Zen! Beautiful stitching, by the way... I haven't done stitching in years but I should re-learn. I think it would definitely be the stress reliever I'm looking for. I absolutly agree. I can't imagine life without stitching! Weird but true. It's like breathing. You just have to do it! I have never commented before but been reading your blog for ages. Your fabrics are gorgeous and I am absolutely loving your book. Thank you for all the time you spend in keeping us updated and inspired. Ah yes... therapy to the soul. It's nice when you can be soothed by stitching, when your inspiration and tranquility line up just right. Ah, your words are so true and remind me to not neglect these quiet times. I have had this design for a quilt running around in my head for some time now. It includes embroidery, which I LOVE! I think I will get started on it soon! You have inspired me once again. Me too! Stitch I love you! This is exactly how I feel about knitting. When I get started on a scarf or whatever project I'm doing I just can't stop thinking about it until I finish. And when I do finish it, I need to start another, or I start dreaming about it. I love embroidery. I stitch and stitch without a care in the world. 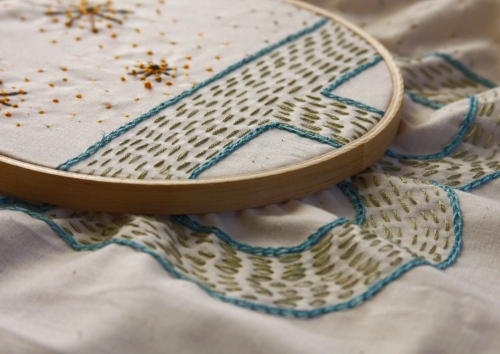 I love the B that you are stitching! The details are so cute! Ah what a lovely post Anna. Your work looks beautiful. It always does. Ooh, I just love how this is looking. Please let us see the final product! And I totally get the feeling of just stitching and nothing else. I can't wait to see how this ends! That is a delightful design! Lovely colors. well, I'm not sure how you knew exactly how to sum up what stitching is for me, but you did. it brings me back to earth, to myself, to my center. What are you making here? It's beautiful, whatever it is. I forgot how much I love embroidery. I think it is time to break out me needle and thread (and hoop) again. What pattern are you using or do you just "wing it." i think this is my favorite post. i'm not sure if it was the perfect stitches, or the cool B...or what really. but it got me thinking, what is it i do, that makes me a better, happier me??? it's wonderful how seeing something and reading someone elses thoughts can help you to think about your own life. even in a little inspiring way. thanks. You took the words right out of my mouth!. As the writer of the 41st comment it would appear that there is a crowd of like minded people. o.k. I'll give it a try. It looks great - I can't wait to see the finished results! Stitching is my way to decompress, too. 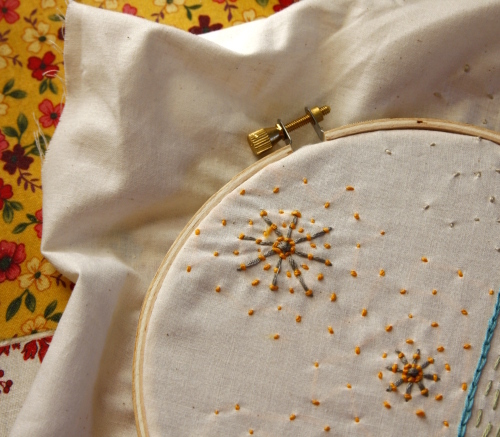 When I stitch I feel connected to the generations before us and a simpler, saner way of life. This looks beautiful and delicate. You should share this with Sew, Mama, Sew - you probably already know it's Handsewing Month over there with lots of ideas and a picture of the day!! love the embroidery and beautiful baby! great photography! I am so with you. Beautiful pictures... treasure the moments! As my husband now tells our friends, quilting/needlework is cheaper than therapy. So sweet. I have just taught my 4-year-old daughter the beginnings of her sewing craft, which you inspired me to do. Thanks for all of your beautiful inspirations. I think I really need to start stitching, I've thought about it before but after reading this I'm reminded that i really must. Just found your blog via Tiny Happy(http://www.tinyhappy.typepad.com/) - she just made a sweet dress from one of your patterns. A lovely blog you have, saving it to come back later. I haven't done stitching for a long time now. Thank you for the inspiring post. I think I'm going to try stitching again. that your great job is clearly identifed. I was wondering if you offer any subscription to your RSS feeds as I would be very interested and can’t find any link to subscribe here. Please come visit my site Directory San Jose City when you got time. that your great job is clearly identifed. I was wondering if you offer any subscription to your RSS feeds as I would be very interested and can’t find any link to subscribe here. Please come visit my site Free Business Listing of San Jose when you got time. Awesome article, definitely liked the info provided. Just subscribed to your blog. Great stuff! . I am new to seo, trying to visit more seo blogs for guides and tips. You can be friends with me. Please come visit my site Bakersfield Business Directory when you got time. Thanks. Awesome article, definitely liked the info provided. Just subscribed to your blog. Great stuff! . I am new to seo, trying to visit more seo blogs for guides and tips. You can be friends with me. Please come visit my site Local Business Directory Of Bakersfield U.S.A. when you got time. Thanks. Me and my friend were arguing about an issue similar to this! Now I know that I was right. lol! Thanks for the information you post. Please come visit my site Stockton Yellow Pages United States when you got time. Me and my friend were arguing about an issue similar to this! Now I know that I was right. lol! Thanks for the information you post. Please come visit my site Chula Vista Yellow Page Business Directory when you got time. This identity and its cheap replica coach bags accompanying popularity has naturally led to many imitators in the high end fashion world. It has also brought about many kfjgcxy0fsd replicas and in its worst times, cheap replica coach purses fake imitations of the originals. Too many stores would dilute the brand in a way, and they choose to keep it elite in a way. These flagship stores will stock the full range of Chanel accessories and handbags, Replica cheap coach bags and purses are expensive and you would have to pay sky rocket prices. But you get replicas of these chanel handbags and you would not even be able to make out the difference. You do not have to shell out mind blowing prices and also quality need not be compromised.Why are Replica cheap coach purses so much in demand? If you observe a replica of a Chanel bag, they are very similar to an original Chanel bag. and if you cannot find what you want, orders can be placed. However, the drawback of buying Chanel handbags from these flagship replica Gucci handbags stores is the high cost you have to pay for them.You can still own a piece of high fashion through careful searching and browsing on the Internet. To own a piece of high fashion, one of the first stops would be the official Chanel outlets and stores located in various parts of the world. Chanel normally has one flagship store in selected countries, replica Coach handbags in part to maintain the uniqueness and high standing of the brand itself. now Goggles to these warm Oakley sunglasses. In truth, this style of Oakley Sunglasses Discount terhjgdf which will definitely or maybe totally match your requires are not often.Eyes usually are delicate and ought to be used focus of when using the best tolerable excellent levels. during that instance, the artisan Cheap Oakley Sunglasses are almost all great concerning ultimate safety and stylishness. That they're created from higher fantastic components cause them to remain out and this also definitely would be the primary intent why there're so high-priced. Acquiring mentioned of which, Oakley Frogskins is actually an clue towards group that artisan Oakley sunglasses aren't their favorite.Luckily,Oakley Jawbone , some on the most hip and outstanding sunglass don for plenty of wearers, are the kinds you will be searching intended for. they're proved to be some on the hottest as well as lasting articles and reviews inside current market. right areas extraordinary operates about most of these Oakley Jawbone Sunglasses . One from the most significant distinctions concerning this Oakley sunglasses together with other like objects is the sizes. Enter into your esophagus comfortably recognized using their company names- outsized.Oversized sun light spectacles are created by additional larger contacts in addition to frames which might be normally 5% to help 10% together with 20% over typical sun light spectacles concerning size. Their big sizing stands out as the most standard mindset with regard to their recognition in the midst of trendy persons. The purpose for the recognition of the people huge type of Oakley sunglasses is frequently explained with two respects. Your forever friend holds your hand and jnjjnd81 tells you that everything is going to be okay.